Luang Poo Waen Sujitnoh was a very good monk. He was very skillful in Sammahti and Dhamma. The most unique nature of Luang Poo Waen, was that he did not like crowded places and loved to live alone in the forests: just like his teacher, Ah Jahn Man; away from people and city. Some people said that Luang Poo Waen had achieved Arahang level. Tahn Jow Koon Noh ever mentioned that "There is a Phra Arahang, but he lives far away, in the forest hill." Luang Poo Waen's hometown was in Leoi Province, North East of Thailand, also known as Issan. Luang Poo Waen was born in BE2431. At the age of 13, he became a Naen (novice monk) in Wat Poh Chai, Leoi province. When he was a novice monk, he studied the Dhamma. 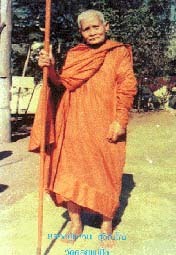 He was very good in Pali and Dhamma, even at that young age. He went Tudong (forest monk) with his teacher, Ah Jahn Wuan, travelling from Leoi Province to Ubon Province.. After he reached Ubon Province, he learned Dhamma from another teacher, Ah Jahn Sing. During his Tudong, he met many disciples of Ah Jahn Man in the forests. They told Luang Poo Waen that Ah Jahn Man is very good in Sammahti and Dhamma. Luang Poo Waen wished to meet Ah Jahn Man and become his disciple. Once, Luang Poo Waen chanced upon another disciple of Ah Jahn Man called Ah Jahn Dteu. Ah Jahn Dteu said that he knew where Ah Jahn Man was, and was willing to bring Luang Poo Waen to meet Ah Jahn Man. Finally, Luang Poo Waen met Ah Jahn Man in BE2462 (at the age of 31) in the Bahn Kor forest, Udon Thahni province. After meeting Ah Jahn Man, Luang Poo Waen, went Tudong again with Ah Jahn Dteu. Luang Poo Waen, endured all difficulties during his Tudong, encountered ghosts, wild animals and other dangers in his Tudong. Luang Poo Waen was not afraid of danger, even the villagers told him that this place or that place are dangerous and eerie, and full of evil spirits, Luang Poo Waen just went ahead because he wanted to learn from all these experiences. Luang Poo Waen spent most of his monkhood as a forest monk, travelling from one province to another on foot, climbing hills, crossing rivers and deep forests. He had also went as far as Laos, Cambodia, Burma and even Vietnam on Dutong. At BE2470, age 39, Luang Poo Waen arrived in Lampang. He met another disciple of Ah Jahn Man called Ah Jahn Keow. He was told that Ah Jahn Man was in Chiangmai. Luang Poo Waen quickly Tudong to Chiangmai to look for Ah Jahn Man. Finally he met Ah Jahn Man and Ah Jahn Dteu at Wat Jedi Luang. Ah Jahn Man officially accepted Luang Poo Waen as his disciple. He studied Dhamma with Ah Jahn Man at Wat Jedi Luang. After Ah Jahn Man left Wat Jedi Luang for Dutong, Luang Poo Waen also went Dutong in Chiangmai. He stayed Wat Huainumrin Chiangmai Province for 10 years. During his long stay in Wat Huainumrin, he stayed most of his time in forests and only went to the temple during the rainy seasons (Khow Pansah). At BE2505, Ah Jahn Noo, the abbot of Wat Doi Mae Pang asked Luang Poo Waen to stayed at Wat Doi Mae Pang because Ah Jahn Noo treated Luang Poo Waen as a teacher. After Ah Jahn Noo passed away, the villagers persuaded Luang Poo Waen to become the abbot of Wat Doi Mae Pang. Luang Poo Waen stayed in Doi Mae Pang until he passed away, living the life as a forest monk all the time in a small hut away from the temple. Luang Poo Waen passed away peacefully on 2nd July BE2528, at Maharaht Hospital (this hospital was built by Luang Poo Waen). Luang Poo Waen was a monk for 78 years, and lived to a ripe age of 98.